The streets and popular press of Fennimore county would have been alive with graphic images, verbal and otherwise. Newspapers, magazines, advertising, catalogues, and programs; posters and billboards, stationary, bills and invoices; one could write a history of Agincourt purely in terms of its graphics. As a designer (by interest, if not vocation) I would clearly have a preference for what I might consider “good” graphics. 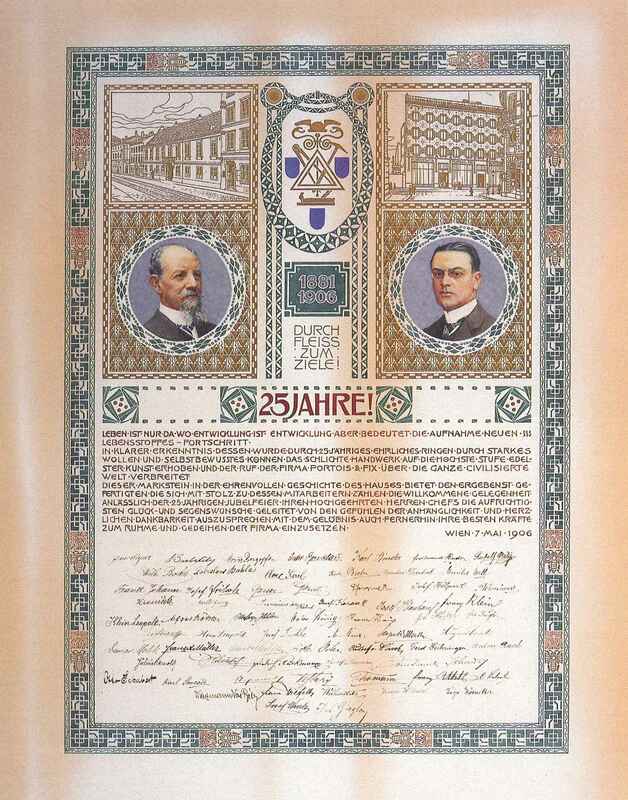 While sleuthing for some images of the Viennese furniture design-manufacturing firm of Portois & Fix (whose headquarters building designed in 1911 by Max Fabiani is well worth the visit) up came this certificate celebrating the company’s twenty-fifth anniversary. What would I give (pay!) to own an original? Jeremiah Johnson has already contributed a graphic piece to the community’s storyline: A poster for “He-She and the Screamers”, the first trans-sexual grunge band to play at Agincourt’s youth music venue, The Yellow Brick Roadhouse. Not only did he create a rock band and its graphic persona, but also the youth scene venue itself. Both of these things I could not have done. I could not have done it now because I’m ancient; I could not have done it as a twenty-something because I had no cultural connection with my peers. Ah, well. masthead for The Daily Plantagenet, Agincourt’s long-standing newspaper. commercial advertisements for grocery and hardware stores, etc. posters for exhibits and public performance (plays, opera, vaudeville, lectures, etc.) at The Auditorium, the college, and other public meeting places. electioneering paraphernalia—and you get to invent the candidates and their issues, which scares the crap out of me. business and personal letterhead and certificates of various sorts (stock, graduation, marriage, et al.). high school yearbooks; “church ladies” cookbooks. Are there others I’ve forgotten/overlooked? Incidentally, I don’t see Kolo Moser’s monogram on this certificate, but it has to be his work. By agincourtiowa in Uncategorized on Friday/16/May/2014 .